I look forward to participating in the Wrightsville Beach Paint Out this weekend. This plein air paint out is organized by the Wrightsville Beach Musuem of History. The paint out will take place on October 10th (Friday) & 11th (Saturday). Artists will be painting 9 AM-4 PM on Friday and 9 AM-2 PM on Saturday. A wet paint sale will take place at the Musuem 2:30 PM- 4:30 PM. Unsold works will be on the display at the Museum till December 12th, 2014. This will be a great opportunity to enjoy and purchase original works of art. Plein Air artists love interacting with people, so, please stop by and say hello. There may be up to 30 artists painting. The weather is going to be nice. I plan on arriving in Wrightsville Beach on Thursday evening and start painting on Friday. As you may have noticed from my Southport paint outs, I paint a lot en plein air! In the past thee Southport printouts, I created a total of 13 paintings of difference sizes: 9×12 to 15×22! I love Wrightsville Beach and have been there many times with my son Ian. We also have friends who live there year-round. I have done sketches while on the beach but this will be my first opportunity to paint plein air there. 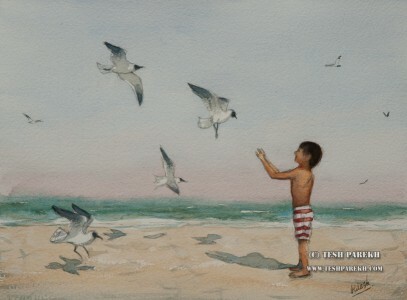 Here is a studio painting of my son Ian feeding seagulls on the beach. Feeding the seagulls. Watercolor painting on paper. My son Ian on the Wrightsville Beach NC. See you at the Wrightville Beach paint out!